In exactly one week from today, KAIRA will be formally opened. Although we have been operating for some time now, all the auxiliary tasks have now been completed and routine operations are now, just that. The event has been timed to exploit the hot Arctic summer, and provide a lead-in to the 100th anniversary of Sodankylä Geophysical Observatory. There are lots of preparations to be done, but also a few interesting things along the way which we'll be sharing. Today's offering is from a new all-sky display that will feature at the opening ceremony. The radio sky image is the one that is already familiar to our readers; it often appears on the right-hand side and updates every ten minutes or so. 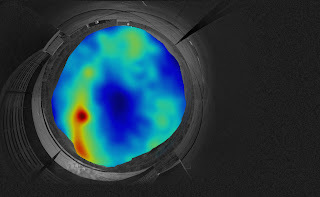 It shows the radio intensity across the sky in false colour. However the foreground of this display is a fish-eye view of the KAIRA site. Imagine lying on the HBA array, looking up, with full hemispheric vision. Then this is the surrounding landscape you would see. North to the top, East to the right. Saana is to the lower left, the VHF is aligned with the tile join, off to the top right. The panorama was made from a series of images taken by Thomas Ulich a while back. We stitched approx. 40 individual frames together to get the landscape panorama, which was then projected and overlaid over the incoming all-sky images. The final display has more to it than this, but we're saving that for the opening! It updates continuously, providing a dynamic display of the invisible radio universe overhead.